Held at the Central European University's School of Public policy in Budapest, "Buddhist Fury: violence against Muslims in Sri Lanka and Myanmar" sought to answer questions on conflict solution, develop policy ideas and share news on the current situation in both countries, with a purpose of releasing a policy paper to help deal with anti-Muslim hatred. The audience heard that although Muslims make up just 9 percent of Sri Lanka's population, Buddhists, who number around 70 percent, appear to fear an increase in their population - fears which have also been expressed in Myanmar. But whereas violence in Myanmar has led to hundreds of deaths, attacks in Sri Lanka have been limited to mosques and the removal of Muslim women’s headscarves, with a few people injured. The Muslim minority expressed concern this week when Sri Lankan leaders of the extremist Bodu Bala Sena group visited Myanmar and met with 969 Movement leaders, extremist monk Ashin Wirathu. Buddhist mobs in Myanmar have killed more than 200 Muslims and forced more than 150,000 people, mostly Muslims, from their homes. Many Rohingya Muslims now live in large camps in Sittwe, the capital of the Rakhine State in Western Myanmar. Wirathu has denied any role in the violence, but critics have said that his anti-Muslim preaching has helped to inspire it. Like Bodu Bala Sena, he has criticized the halal slaughter method, and told Buddhists not to do business with Muslims, urging them to seize their land. 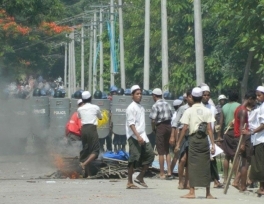 The government of Myanmar denies any massacre of Rohingya has taken place. A presidential spokesman, Ye Htut, in a recent interview with The Myanmar Times, described accusations that Rohingya have been persecuted as "baseless." The Budapest panel debated different solutions to anti-Muslim violence, among them the involvement of 1991 Nobel Peace Prize winner Myanmar pro-democracy leader Aung San Suu Kyi. Suu Kyi - for long a beacon of the Human Rights community - has been criticized for not playing a role in raising attention to the Rohingya's plight and easing the hatred. The panel discussed tactics used by extremist Buddhist groups and how widespread anti-Muslim language had become in the two societies. Professor Robert Templer, Director of the Centre of Conflict Negotiations and Recovery, asked Richard Reoch, President of Shambala, a Buddhist organization based in London, why are Buddhists killing? Reoch said that the three factors together could make people forget about their faith and carry out acts that are unbefitting to them, regardless of the faith of the individual.